The Prosafe® 750 uses a coded key-card locking mechanism to unlock it.The advantages are that you don't have to keep extra keys with you and you don't have to remember any code! To unlock your lock, you just need to insert either of the punched corners of the card into the lock slot from the top of the slot in a 90 degree position. Press firmly until lock snaps open.To lock it, simply press the shackle closed. Remember to keep a note of the key-card code stamped underneath the key-card so that if you lose your key-card, you can contact our customer service and quote the code for a replacement. 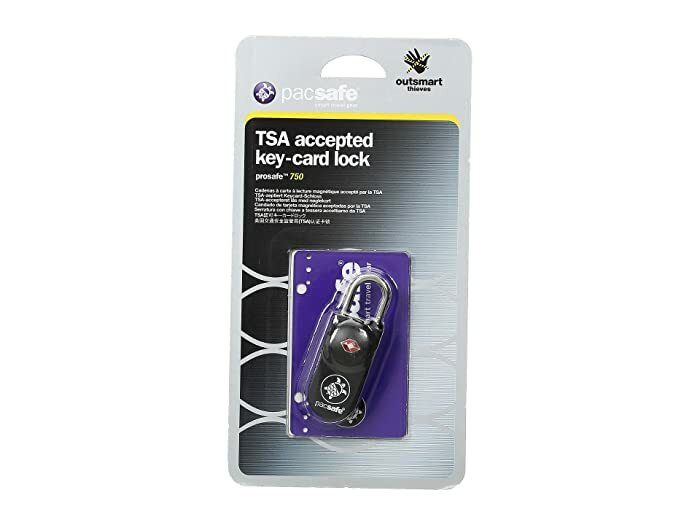 The Prosafe® 750 is TSA accepted which means TSA (US) agents and HRSC (UK) officers can safely and securely open and relock your bag using codes and secured tools. Two credit card sized key-cards included.